A fresh story devised and illustrated by children, for children. Be prepared for a unique take on some Christmassy themes in the snowy forests of the far north, with a quirky soundtrack to match. A kind-hearted Elf takes time out from her busy woodworking schedule to nurture a magical bird, and in doing so not only saves Christmas, but indirectly makes the dark forest paths safer for her co-workers during the toy-making seasons to come! It couldn’t be much simpler - simply swipe left and right to flick from page to page. We’re always keen to hear what you think about our applications. 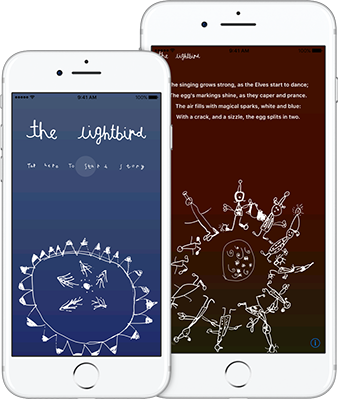 You can send any feedback, comments, or suggestions directly to lightbird@mousepickle.com .